CBSE Sample Papers: Old Question Papers for CBSE Class 9,10, 11, and 12 Classes available on this page. All CBSE Board Students can download CBSE Model Question Papers for free of cost. These CBSE Sample Question Papers are designed as per the latest CBSE Syllabus. With the help of CBSE Board Papers, students can know Latest Exam Pattern, Marking Scheme etc. So, get CBSE Papers and start practicing them to score handsome marks in Board Exams. 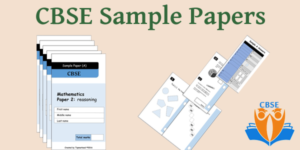 Go through the below sections for the free download of CBSE Solved Sample Papers for Class 9, 10, 11, and 12. Central Board of Secondary Education is an India level educational Board. CBSE Board is under the control of Central Government. A number of public and private schools are affiliated to CBSE Board. CBSE itself prepares the Curriculum and organizes exams for these schools. All the CBSE Board Exams are in high standards. So, to score better marks in CBSE Exams is a challenging task for the students. All the students must prepare hard for the CBSE Exam to achieve good marks. So, to help all the students, CBSE uploaded Sample Papers on its web portal i.e. cbse.nic.in. Students can download CBSE Old Question Papers from Class 9-12 from CBSE Public Portal and from here also. 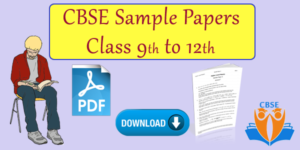 On this CBSE Guide, we have uploaded Sample Question Papers from 9th Class to 12th Class. The Sample Papers are prepared for various subjects like English, Maths, Science, Social Science, Hindi etc. We have also uploaded CBSE Board Papers for Vocational Subjects like Accountancy and Taxation, Automobile Technology, Banking, and Insurance, Horticulture, Food Production, Information Technology etc. Students can download all subjects CBSE Sample Papers from here for free of cost. CBSE Board Exam particularly from Class 9 – 12 is extremely important for the students in shaping their career. Preparing for CBSE Exams in a better way and scoring good marks is essential. So, in this regard, we are providing CBSE Board Papers from Class 9- 12. Students are advised to solve a plenty of Sample Question Papers. Then, you can be familiar with the type of questions asked in Board Exams. Also, get a clear idea on the difficulty level of Exam Paper. The provided CBSE Old Papers cover all the important questions in an examination perspective. Do you know one thing? CBSE most of the times put the same questions in the Exam Paper that has already asked in Previous Years. If you want to know, then download Last 5 Years CBSE Question Papers, observe all the questions. You can notice some of the questions in the CBSE Papers are repeated. Hence, get CBSE Old Papers and start practicing them. All CBSE Class 9 students preparing for Board Exams can include Sample Papers in their Exam Preparation to score better marks. Solving CBSE Sample Papers will definitely help you to score handsome marks in Board Exams. These केंद्रीय माध्यमिक शिक्षा बोर्ड Papers designed by the experts as per CBSE Curriculum. Students can know Marking Scheme, Exam Pattern from CBSE Papers. The Class 9 CBSE Question Paper Pattern is already predefined. There are some gaps between Question Paper Pattern and Course Content. Students must identify these gaps. This is possible only if you refer CBSE Papers along with Solutions. This will not not only helps the students to prepare for Board Exam in a better manner but also leads you to the depth of the topic to be studied. So, we are providing Solutions for all the questions of CBSE Exam Papers Class 9. Get cbse.nic.in Question Papers and refer the solutions to perform well in CBSE Board Exam. CBSE Question Paper Class 10 available now for free download. From these CBSE Papers, students can get an idea about upcoming Board Exam Question Paper. Practicing CBSE Previous Year Question Papers Class 10 Pdf, students can increase their speed and solving skills. Also, you can manage your time management skills. Then, you easily attempt more number of questions in less time. Based on CBSE Class 10 Marks, students start deciding in taking the right group in Plus One. That means, if they got good marks in Maths, they will choose MPC. Like that, if they got better marks in Biology, they will select BPC. So, 10th Class is the deciding factor in deciding your educational career. To score well in Class 10 Board Exams, we are providing Sample Papers. Solve a number of CBSE Sample Papers. These CBSE Question Paper for Class 1o students are recommended because you can understand the concepts in a better way. Also, you can know your weak areas where need to work a bit harder. Are you studying CBSE Class 11 and wish to score good marks? Then, you need to practice CBSE Class XI Sample Papers to achieve your goal. Solving CBSE Sample Papers Class 11 thoroughly, students can relieve stress and fear. At the time of exam preparation, some doubts may arise for the students. To clarify all your doubts, you must practice Class 11 CBSE Question Papers at least for 2-3 times. Students can plan a nice schedule and allocate particular time fo each paper. Now honestly solve the Sample Papers, without seeing Solutions. This will help to evaluate your preparation levels. Also, calculate the devoting time with actual time to each question in a planned manner. By doing like this, students can increase their time management skills. If you want all these advantages, then get the cbse.nic.in Papers right now and start practicing them. Of all the CBSE Classes, Plus Two is a little bit difficult in scoring good marks. Are you worried about how to score handsome marks in Class 12 CBSE Exam? So, to help you, we are giving a preparation tip. That is, practicing CBSE Sample Papers for Class 12. By practicing CBSE Previous Year Question Papers Class 12, students can boost their confidence levels. Many of the students prepare well but often perform badly on the Exam day. This is due to lack of confidence and nervousness. Those students are advised to solve a plenty of CBSE Sample Papers Class 12. When you practice enough CBSE Class 12 Question Papers, you can expect what exactly asked in Board Exam. Students can get a clear idea about Exam Pattern, Marking Scheme. Improve their speed and time management skills. Students can evaluate themselves with the help of CBSE Net Old Question Papers with answers. Students feel stressful during the Exams. If you are preparing for any Board Exam that means too much stress. You can reduce your stress by solving more and more CBSE Sample Papers. Actually, these are the comprehensive way to prepare for any Board Exam. The provided CBSE Board Exam Papers are helpful for the competitive Exams also. Students can get a reputed rank in other competitive exams, by solving CBSE Model Papers of all subjects. When you are solving CBSE Practice Papers, try to give your best. This helps to recognize your weak points and strong points. Frequent revision with CBSE Past Papers is extremely important for the students. After completing your Exam Syllabus, start solving 2-3 Papers for a day. Solving these CBSE Sample Question Papers increases your accuracy and thus you can get more marks. Hence, download CBSE Model Question Papers from Class 9 – 12 from here and start revising them.